Forget sticks, and stick with carrots instead. So says Brent Schulkin, founder of a fledgling movement of activist consumers employing a kind of reverse boycott that he calls a Carrotmob. The concept is simple: instead of steering clear of environmentally backward stores, why not reward businesses with mass purchases if they promise to use some of the money to get greener? 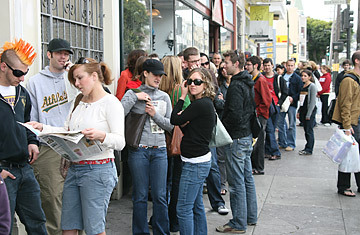 The movement was born on March 29, 2008, when hundreds of green-minded patrons poured into a San Francisco convenience store after Schulkin solicited bids from 23 stores in the area to find the business that would promise to spend the highest percentage of Carrotmob profits on more energy-efficient lighting. The crowd spent more than $9,200 at the K&D Market, which then fulfilled its pledge to plow 22% of the day's revenue into greener lighting  with the haul from the Carrotmob providing enough cash to make all the improvements recommended by an energy auditor (and Carrotmob supporter). The reverse boycott is perfect for the growing cadre of slactivists  slackers who care just enough about causes to sign online petitions and join Facebook protest pages but lack the time, money or drive to do much else. Carrotmobs also carry extra appeal during tough economic times. Participants don't have to donate anything. They just shop for products they were planning to buy anyway, adjusting the time and place of purchase. By doing so, they help green a local business. So what's next for Carrotmobbers? In addition to Montagnaro's plans for Philadelphia, activists in Hoboken, N.J., Kansas City, Mo., and elsewhere are gathering forces through Facebook, Twitter and the main Carrotmob.org hub. Meanwhile, Schulkin is focusing on a for-profit Carrotmob spinoff called Virgance, which starts up and acquires small organizations that offer collaborative market solutions to social and environmental challenges. One of the first fruits of the effort is 1BOG, a community-based program that organizes residents locally to negotiate group discounts from companies that install solar-energy panels. Says Schulkin: "What's good for activism is also good for business." Carrots are looking greener every day.